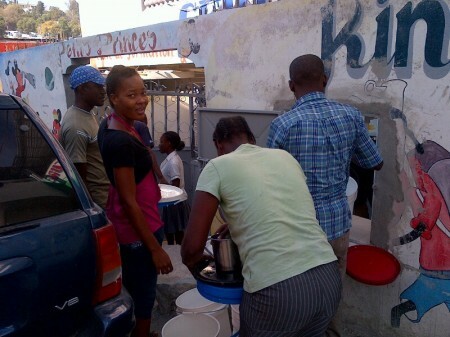 LGF recently completed work at a new clean water kiosk in the South East Department of Haiti. We are proud to partner with the Gaskov Foundation on this great project, the first clean water kiosk in the entire region. Prior the locals had to travel up to 40 minutes by car to collect water. We anticipate that the number of cholera cases in the area will drop now that the local people have access to clean water year round. Providing clean water to earthquake-ravaged Haiti is no simple task, but Bobbi Dunphy is spearheading a vital ‘profit for purpose’ initiative that will not only provide advanced water purification technologies but will also help Haitians get back on their feet. As Chief International Officer of LifeGivingForce (LGF), Dunphy is spearheading a bold initiative to get clean water to Haitians, who are trying to not only rebuild their fractured country but are also dealing with a rampant cholera outbreak. “Even prior to the earthquake, water and sanitation were an acute problem but now cholera is endemic and you have a situation where virtually no water source is safe,” says Dunphy. Since the earthquake they have provided clean water to over 500,000 Haitians with 47 installations country-wide in Haiti. By utilising a model of ‘profit for purpose’, LGF leverages the most advanced water purification technologies and expertise to provide water solutions in the most challenging settings. Directly after the earthquake in Haiti on 12 January 2010, LGF Haiti (the Haitian subsidiary) deployed numerous emergency response water purification systems (producing upwards of 10,000 litres a day from a mobile suitcase) to clinics, IDP (internally displaced person) camps, schools and orphanages in multiple regions in Haiti. Living away from her beloved homeland for the majority of the past 25 years in Tokyo, Stockholm, New York, Barcelona, London and San Francisco, Dunphy now splits her time between Haiti (70 per cent) and her Northern Californian home in lush Mill Valley north of San Francisco (30 per cent), which she shares with her husband of six years, American-born Thomas Christenson. She was inspired by the tenacity and drive of her father, Frank Dunphy, who was one of Australia’s youngest-ever QCs (Queens Counsel) specialising in personal injury. He succumbed to cancer at the age of 40 when Dunphy was only 15. “He was a brilliant guy and very ambitious and his premature death led me to become a perennial searcher. I thought a lot about the meaning of life and searched hard for something that made sense to me in terms of a legacy,” she says. After completing a double major in English Literature and Politics at Melbourne’s prestigious Monash University, Dunphy spent the early part of her career juggling her various jobs in the film industry as a producer working with such luminaries as celebrated Australian film director, Fred Schepisi and her deep resolve to help the planet. “I have always been a vested member of every community I have lived in so the lines blur between the professional, the philanthropic and the personal,” she says. After a chance meeting with Australian philanthropist/entrepreneur Steve Killelea, she became a Founding Member and Project Director of the Global Peace Index (GPI) initiative which is recognised worldwide as one of the key indices for the measurement of peace. Dunphy was also instrumental in the production of the accompanying award-winning documentary, Soldiers of Peace, which celebrated the unsung heroes working on peace initiatives, travelling extensively to capture their stories on film. Dunphy’s call to Haiti came when she was approached by the founding members of LGF, Shane Hackett and Sung Cho, who had already been working in the impoverished nation supporting the Cambry Orphanage in Les Cayes. They asked her to draft a plan for sustainability. The core team of social entrepreneurs who make up LGF’s US division sat down together six days before the earthquake to discuss what their strategy would be going forward. 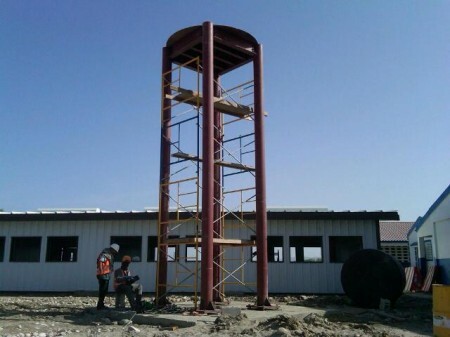 LifeGivingForce LLC is a for-profit entity specialising in economically sustainable infrastructure for potable water in urban and rural communities in Haiti. Economic sustainability and local capacity building are key aspects to LGF’s mission and objectives. LGF provides water purification systems that are energy-efficient and self-sufficient, and are easy to maintain over the short and long term. “Our systems produce high-quality water at low cost.” Their systems remove 99.999% of all known bacteria, viruses and cysts including e. coli and vibrio cholerae but leave in minerals which contribute to good nutrition while ensuring that the water actually tastes good. LifeGivingForce LLC works in parallel with its sister organisation, LifeGivingForce Foundation, a non-profit foundation delivering life-saving water and social and economic development programs in Haiti. 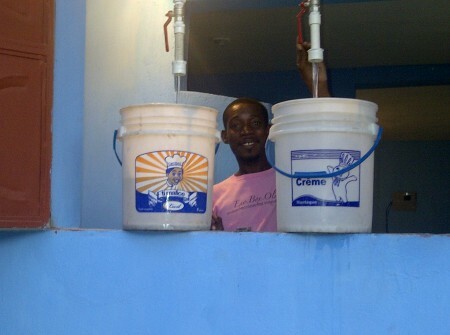 Some of LGF’s many projects include the installation of a clean-water system at Jacmel prison as part of the overall cholera mitigation response strategy. At the Wharf Jeremie Clinic, providing clean water on a daily basis was the key factor in reducing the number of cholera cases being diagnosed each day from 80 at the height of the outbreak down to five a day. They also work closely with Sean Penn’s organisation, J/P HRO. They donated one of their emergency-response clean water purification systems to assist in their support of the Petiónville Golf Club IDP camp helping over 100,000 people directly after the earthquake. 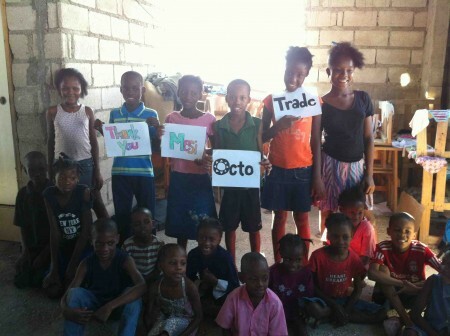 They are now partnering with them on an entrepreneurship project to help Haitians get back on their feet. “A lot of celebrities fly in and fly out, but Sean and his organisation are really committed and they are looking at the long term and that’s why we are so keen to work with them,” says Dunphy. 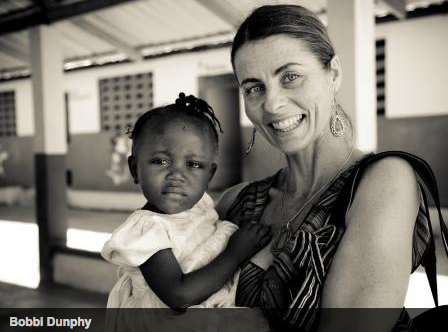 Now spending 70 per cent of her time in Haiti, often contending with difficult water, sanitation and safety issues on a daily basis, Dunphy has grown to appreciate the simple things in life. “I will come back to my home in California and just to be able to turn on a tap to clean my teeth or get a glass of water seems like a luxury to me. Haiti has really given me a perspective. I certainly don’t sweat the small stuff anymore,” she laughs. Dunphy was recently selected as one of 50 Australians to be honoured at a “50 for the Future” summit held in Silicon Valley by Australia’s global initiative, Advance. The event celebrated some of Australia’s most dynamic entrepreneurs who are shaping the innovation agenda. JACMEL, Haiti — The panic began to set in after Tropical Storm Isaac’s rains had subsided and the sun finally began to shine on this storm-damaged beachfront hamlet. Frantz Pierre-Louis, looking at the trail of fallen trees and flooded farms confronting him, had something much more pressing on his mind. 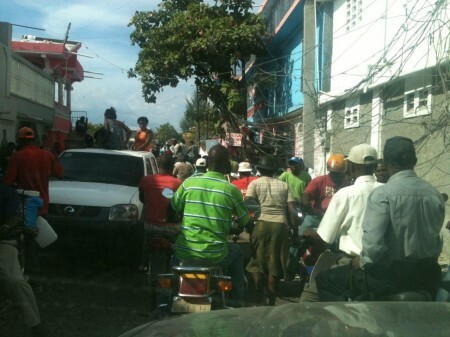 “We have to prevent a cholera outbreak,” Pierre-Louis, sitting in his pick-up truck, said, his voice filled with urgency. 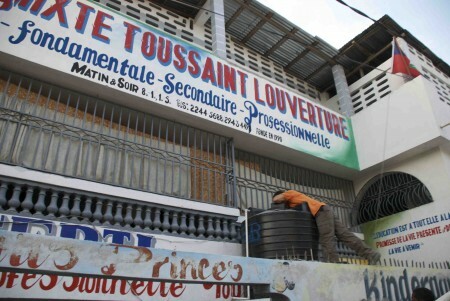 Just when Haiti thought it had cholera under control, Tropical Storm Isaac came along. The storm left at least 24 dead in Haiti, and reignited fears that the floods and rains could accelerate a peak in cholera deaths and infections. Even worse, the deadly diarrheal disease could spread to the sprawling tent cities in Haiti’s capital where 390,000 victims of the January 2010 earthquake still live and where — until now — it has remained at bay. “Today with the situation in the camps, it is clear they are most at risk,” said Yolette Etienne, Oxfam’s program director, alluding to the lack of potable water in camps. Last week, U.N. Secretary General Ban Ki-moon told the U.N. Security Council that living conditions in many of the 575 camps have deteriorated to the point where Haitians remain “extremely vulnerable” to cholera, and the government’s Health Ministry is unable to effectively address a crisis on its own. “The resurgence of the cholera outbreak is particularly worrying since non-governmental organizations, which responded at the beginning of the epidemic, are phasing out due to lack of funding,” Ban said. This is especially true in flooded communities, where the drinking water is at risk of becoming contaminated by wastewater from latrines. Along Route 9 near the Cité Soleil slum in the capital, for example, a nearby river flooded about 1,200 homes, turning front rooms and yards into chocolate-colored lakes. Diana Victor’s family house was among those that were flooded, the young woman said, sitting on a cot at an MSF cholera treatment center. Weak and her voice barely audible, Victor, 21, said she has no idea how she contracted cholera. Schulz said while cholera is easily preventable, it is also easy to get, especially when heavy rains and floods limit access to clean water. “You might have a nice distribution of soap for instance, but if you don’t have clean water to wash your hands, the soap is useless,” he said. The annual Atlantic hurricane season, which runs from June 1 to Nov. 30, has become a dreadful reminder of not just how environmentally fragile Haiti is, but how susceptible Haitians are to contracting cholera, the deadly waterborne epidemic that arrived in Haiti two years ago next month. Nepalese U.N. troops have been accused of bringing cholera to Haiti after the Artibonite River, located near the troops’ latrines, became contaminated with the cholera bacteria. On Wednesday, more than a dozen human rights groups are expected to issue a letter renewing calls for the U.N. to make clean water and sanitation available in Haiti to help curtail the cholera crises. Cholera has killed more than 7,500 Haitians and sickened more than 588,000 in what some describe as one of the worst epidemics in recent years. The number of cholera cases international medical aid groups, such as MSF, treat in one day is an epidemic in some African nations, said Schulz, noting that MSF has already treated 12,000 patients since January. “That’s a full blown state emergency for many,” he said. Within days of Isaac’s passing, MSF reactivated cholera beds — cots with a hole in them — at three of its four cholera treatment centers in the metropolitan Port-au-Prince area. Another group, Boston-based Partners in Health, put staff on notice and relocated supplies from the capital to rural areas where many lack access to potable water and health facilities. Dr. Louise Ivers of Partners In Health, which just completed a pilot cholera vaccination program in Haiti, said the group has yet to see a spike. But she remains deeply concerned about the epidemic’s impact. Haiti’s Health Ministry statistics show that although the number of cases is “significantly fewer than this time last year,” Haitians continue to die at an unacceptable rate. Health Minister Florence Duperval Guillaume said the government is equally concerned about cholera-related deaths as well as infections. Before Isaac’s late night arrival here, the ministry ordered all government hospitals and clinics to remain open for 24 hours for at least four days after the storm’s passing. Hospital pantries, Guillaume said, were stocked with chlorine tablets, bottled water and oral rehydration salts. “All is well positioned … for the prevention and care of patients,” Guillaume said. In addition to stepping up surveillance for new cases, health officials are working with a number of aid organizations such as Oxfam to scale up cholera response. Oxfam is currently rehabilitating dozens of damaged oral rehydration salts stations in the capital and making repairs to broken drinking wells in the Artibonite River. Dr. Arthur Fournier of Miami-based Project Medishare said the Central Plateau, which was spared most of Isaac’s wrath, also hasn’t seen an uptick and the aid group hasn’t reopened any of its treatment centers so far. “We’re holding our breaths,” he said. PORT-AU-PRINCE, MAY 9, 2012—Cholera cases are on the rise in Haiti following the onset of the rainy season, and the country is not adequately prepared to combat the deadly disease, the international medical humanitarian organization Doctors Without Borders/Médecins Sans Frontières (MSF) said today. While Haiti’s Ministry of Health and Populations claims to be in control of the situation, health facilities in many regions of the country remain incapable of responding to the seasonal fluctuations of the cholera epidemic. The surveillance system, which is supposed to monitor the situation and raise the alarm, is still dysfunctional, MSF said. The number of people treated by MSF alone in the capital, Port-au-Prince, has quadrupled in less than a month, reaching 1,600 cases in April. The organization has increased treatment capacity in the city and in the town of Léogâne, and is preparing to open additional treatment sites in the country. 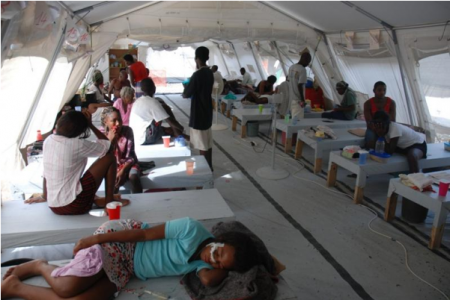 Nearly 200,000 cholera cases were reported during the rainy season last year, between May and October. The majority of Haitians do not have access to latrines, and obtaining clean water is a daily challenge. Of the half-million survivors of the January, 2010 earthquake who continue to live in camps, less than one third are provided with clean drinking water and only one percent recently received soap, according to a April 2012 investigation by Haiti’s National Directorate of Water Supply and Sanitation. 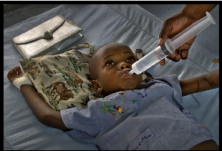 While the cholera vaccination being used in some parts of Haiti can help control the disease, it is not a foolproof solution. The vaccine provides immunity for approximately three years and is estimated to be only 70 percent effective. Only major improvements of Haiti’s water and sanitation systems will provide durable solutions to the epidemic, but that will take time. 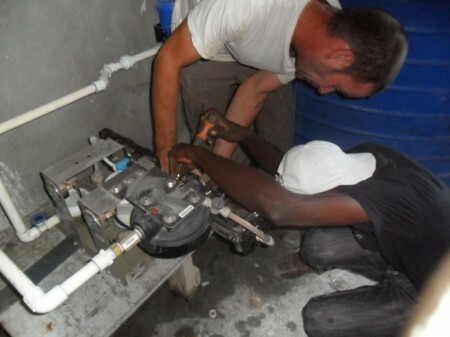 Since early Feburary, an apparatus for treating water by ultra filtration (UF) has been in operation at the Jacmel prison in the Southeast Department. 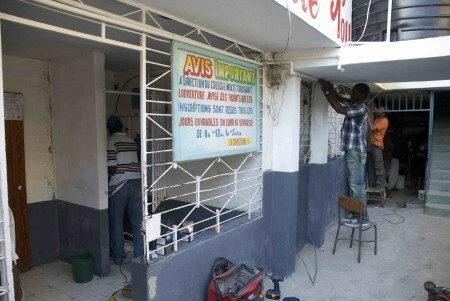 Its installation was funded by the Community Violence Reduction (CVR) Section of MINUSTAH, and implemented by the NGO Life Giving Force (LGF Haiti). The project is part of the program to mitigate against the cholera epidemic in South-East department, and includes the installation of such devices in Multipurpose Centres in seven communities in the South East and in some detention centers in the country. 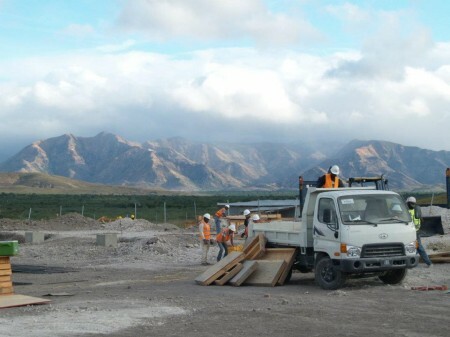 With a capacity of 20,000 lit ers per day supplying safe clean drinking water for upwards of 5,000 persons, the recently installed UF water treatment system can provide continuous drinking water for both the administrative staff and inmates over the long term, and thus significantly reduce the risk of contamination by waterborne diseases, especially cholera. 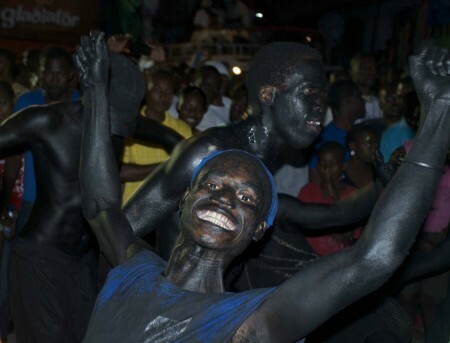 As for the prisoners, their relief is evident as they use this precious resource. 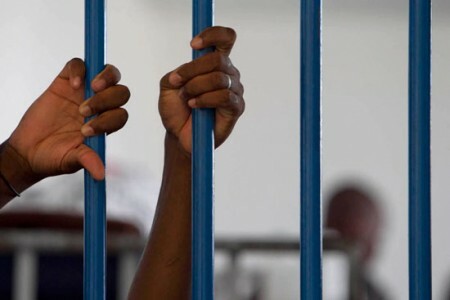 “The installation of this unit has brought us great relief because up until now we have only received an erratic supply of tablets” – Aquatabs – “to treat tap water,” said one young prisoner. 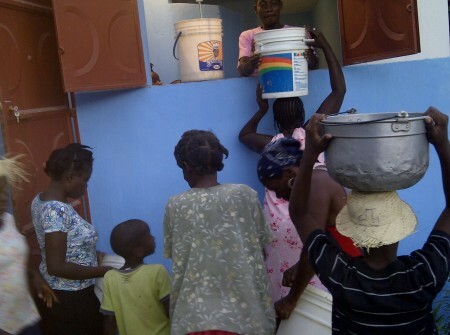 Equally, LGF Haiti’s ultra filtration water treatment systems were welcomed by those using the community centers in the seven regions in which they were deployed. In operation in these multi purpose centers since November 22, 2011, the LGF 20k UF systems, capable of producing 20,000 lpd of clean drinking water, are powered by solar making them completely autonomous. 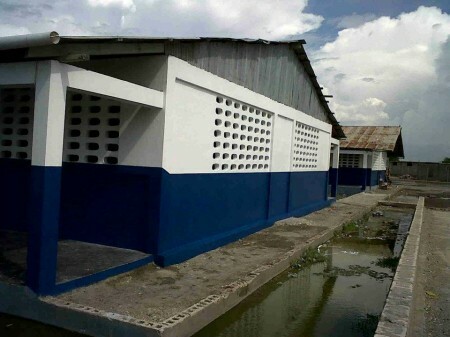 The construction and fit out of the community centers located in Grand-Gosier, Belle-Anse, Marigot, Cayes-Jacmel, La Vallée, Bainet et Côte- de-Fer were funded by the UN MINUSTAH CVR section for a total of US $1,367,000. This place is crazy. And it was just Carnaval. So multiply by that x 100. It’s loud, dusty, dirty, unorganized, under resourced, over priced, confusing, dangerous, beautiful, luring and despite it’s chequered history, completely full of life. The kind of zest that is difficult to find in most developed nations yet beyond the smiles and laughter, the need for clean, disease free water is so imperative that without it it will be difficult to get this nation back on it’s feet. Fresh off a couple of weeks on the ground here in Port au Prince makes one’s head swim. In some ways I realize that I’m not doing it too hard as I’m not living cheek by jowl with other unfortunate IDPs in a tent camp but instead I have a roof over my head, clean sheets on my bed and access to good food when I need. Oh, and, not to mention the internet. But I have been out in the field, learning and helping as much as I can with the installations of various LGF Haiti clean water projects all of which are located in struggling neighborhoods where people often walk great distances just to get dirty water out of a dirty truck. It’s amazing that these projects get completed because everything is so much more difficult than you would ever imagine. I have traveled quite a bit globally and had some inkling of what I was getting into here but the traffic here was the first aspect that I had completely underestimated. What should normally take 20 minutes could easily be a couple hours often stuck in bumper to bumper amongst a loose interpretation of lanes. Cars and trucks are so twisted they appear to be driving sideways on things that resemble tires. Potholes here are more like sinkholes. It’s like an ad for “4 Wheeler Magazine” and when you’re stuck in it, the street kids approach your car often rubbing their bellies with one hand while the other is open and empty. “I’m hungry.” It kills you. But they’re working it and getting things done in their own little orb. We have some Haitian friends who talk about what Port au Prince was like in the 70’s with a population of around 300,000. Now some estimate it to be over 3 million and the proper planning for such an expansion never happened. But the earthquake did and there’s still more than enough evidence of it’s destruction as you make your way around the quagmire. When I look around, I can’t imagine where to begin. Should I pick up that piece of rubbish? Where to put it? But reliable sources say that the city is so much cleaner than even 6 months ago with various recycling and waste removal programs in tact and the tent cities are shrinking. It’s a good reminder of the fact that the last person was moved out of their tent 10 years after the Kobe, Japan earthquake. And that’s an industrialized nation. People talk about ‘reconstruction’ here in Haiti. When it comes to water and sanitation infrastructure, it should really be referred to as ‘construction’. There was little to no infrastructure prior to the earthquake so we’re all starting from scratch here. So to focus on the smaller picture sometimes is best and building out these clean water kiosks as businesses seems to make good sense. A few of the recent kiosks are now being powered by solar arrays which is an exciting piece of the puzzle. Off grid is pretty good when the existing grid is unreliable at best. The in-country LGF Haiti team is wonderful and very hard working. It has been a pleasure to finally place the faces with the names and they are doing a fantastic job with all of the training that goes along with setting up these kiosks. Eager locals lap up all the information behind the technology and how to sell the water to profit their community, clinic or school as well as build their own business. We have been working with the World Bank and Sean Penn’s organization J/P HRO on some recent projects with schools and clinics. They have been fantastic partners as well which in this challenging environment is the only way to achieve anything. Then there’s Chicken Alley. Chicken stand after chicken stand lining the street with vendors fanning the flames with paper plates, yelling and vying for business. Jim loves it there and in the darkness of the night, it looks like a gnarly film set but I will tell you this…..the chicken was very, very tasty indeed. And the next day?…… all was well. 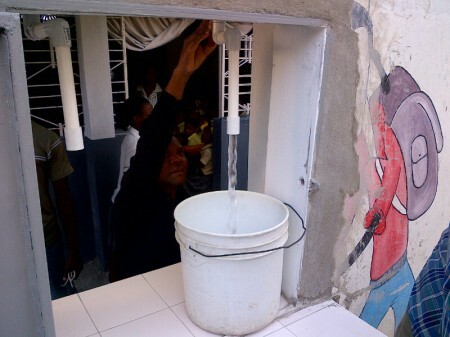 LGF Haiti recently completed another clean water project in conjunction with Sean Penn’s organization, J/P HRO, at the College Toussaint Louverture in Delmas 32, Port au Prince. Managed by our partners J/P HRO, this pilot project is part of The Helping People Home Initiative which aims to relocate families back to their neighborhoods from the IDP camp at Petionville Golf Course. As an incentive, the school will be giving the purified water to their 300 pupils and the excess will be sold to the local community at a reduced rate to help fund the day to day operations of the school. The next project is fitting a free clinic in the same neighborhood, run by J/P HRO, with a desperately needed ultra filtration system. This installation should be completed in the coming days and more photos will be posted on the blog as well so stay tuned… Thanks to J/P HRO for being such great partners. The LGF Haiti team working on the install.